There were four bulls and they were very close friends. They always lived close by and grazed together. In the same forest, there lived a lion. This lion used to watch them from a distance and wanted to eat them all. Since the bulls were always grazing together, the lion knew all four of them would hit him back. So he was waiting for the right time to attack them. As the days passed by, a small problem started between the bulls. 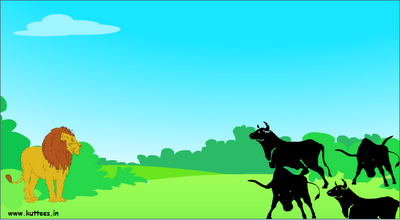 The problem got bigger and bigger and as a result, the bulls fought among themselves. Each bull went in their own ways and lived a lonely life. The lion was waiting for a moment like that. He attacked and killed the bulls one by one.